Sheffield City Council’s response to the DfT consultation goes against officially stated council policy of supporting lower speed limits on the M1. Their opposition to lower speed limits cited concerns about the economic impact, public reaction, enforcement and investor perception of Sheffield. We have air quality problems in Sheffield. We have an air quality action plan that calls out the M1 double decker viaduct as a problem. 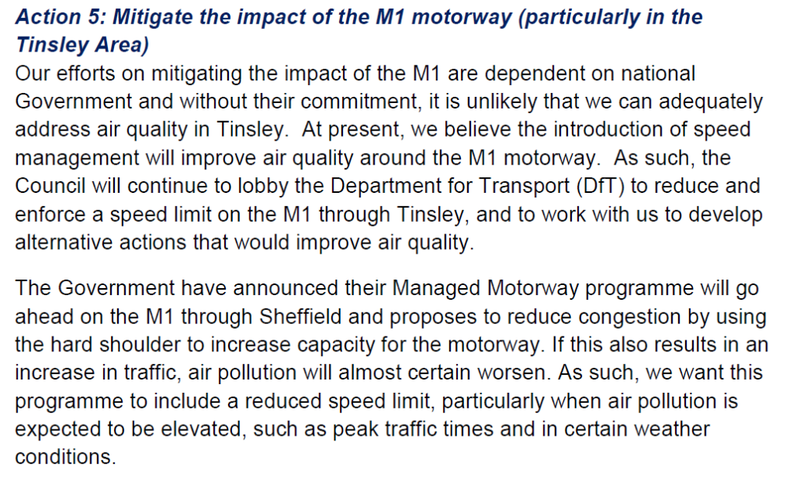 The area around the M1 is called Tinsley and the air quality is notoriously bad and breaches EU limits for NO2 for most of the year. The DfT decided that they’d like to add an extra lane to the motorway and a consultation was launched to find out if people think reducing the speed limit to 60mph is something we should do to offset the damage. Sheffield Council submitted a response that was summed up as. Unitary, county and district authorities… responded with detailed comments on the proposal, but all except Nottinghamshire County Council were ultimately opposed to the proposal. 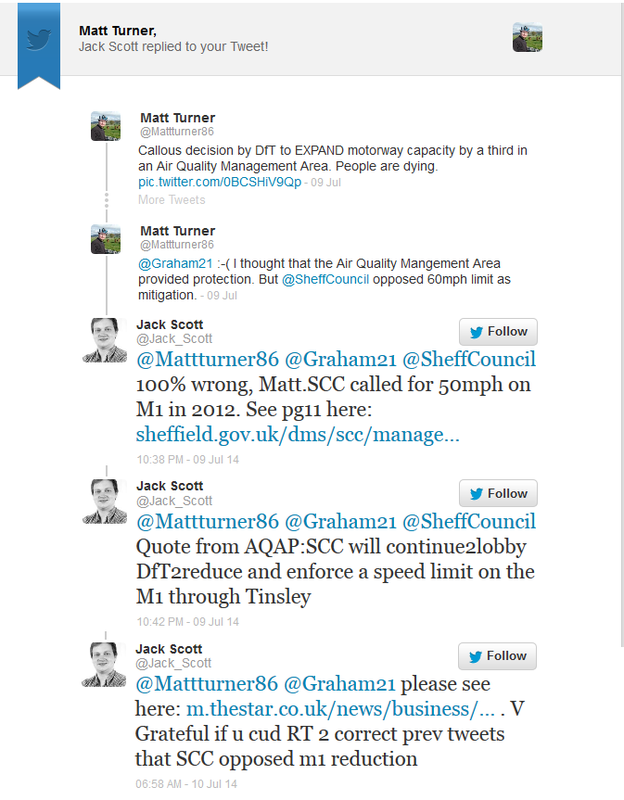 Jack Scott, cabinet member for the environment disagreed that this was the response, he said that SCC wanted lower speed limits, will continue to lobby DfT for lower speed limits and planned to write to the DfT because they had misrepresented SCCs response. These tweets have now been deleted from Jack Scott’s Twitter feed. I couldn’t agree more with his views and the council’s policy on this, they’ve got it right. The Sheffield Air Quality Action Plan includes policy to support lower speed limits. However Sheffield City Council’s consultation response objected to lowering speed limits. I think it’s disgraceful that there are still people in Sheffield City Council who trade off the lives of people against the perception of Sheffield to investors. The City Council is concerned about the economic impact on the Sheffield City Region of the reduced speed limit on the 32 mile stretch of the M1 for an indeterminable time period. The Highways Agency has not modelled or made clear what the full impact of the proposed speed limit on the [sic] will have on the surrounding road network, the local economy and the development aspirations of South Yorkshire and the Sheffield City Region. Sheffield City Region, along with the South Yorkshire Passenger Transport Authority (who have responded separately to this Consultation) would therefore, like the Highways Agency to further clarify and provide appropriate evidence on the potential economic impact of the Smart Motorway proposal operating at a maximum 60mph speed limit. It is unclear how the speed limit will be enforced (and how the public will react) to ensure the claimed effect of mitigating the impact, particularly on air quality. There is also an unresolved issue of ‘perception’ which is likely to affect the attractiveness and competitiveness of the Sheffield City Region in our desire to seek much needed inward investment. Such investment may be deterred if it is perceived that the sub-region required such onerous measures to deal with existing or likely future problems whereas others do not (in part at least through previous investment in national infrastructure). It’s very clear that there is strong support for lower speed limits from the top of Sheffield City Council, it’s supported by cabinet members and council policy, however we need to find out why the official council response opposed lower speed limits. Sheffield City Council’s official response to this consultation can be found here. The Sheffield City Council Air Quality Action Plan can be found here. This entry was posted in air quality on July 30, 2014 by Matt.